Answer: Is it legal? Of course. Is it for real? Depends on what you mean by “real.” Several companies are marketing these star-naming packages. All of them admit they aren’t really selling you a star, since nobody owns the stars. They also make it clear that the name you choose is not officially recognized by scientific organizations. See, for example, this page from the FAQ on their website. I should note that the Outer Space Treaty of 1967 prohibits ownership of any celestial body, claiming that all of space is the common heritage of mankind. That will need to change once the Moon and Mars have permanent settlers, and issues of property rights and resources become important. But you can’t buy or name a star “for real.” In fact, street names chosen by real estate developers carry more legal weight than purchased star names. It is, however, a cool way to get people interested in astronomy. As long as you realize that what you’re getting is akin to buying real estate on the Moon, or “adopting” a polar bear or tiger from the World Wildlife Fund. Take a look at the image above. It shows a familiar constellation known as the Big Dipper. All the really bright stars already have official names that date back millennia, and come from Latin, Greek, or Arabic. It gets a little more complicated in the far southern hemisphere. Those stars (and constellations) were officially mapped by early seafaring explorers. Their names were assigned in the Bayer or Flamsteed catalogs, and date back a few centuries. So the stars you can “buy” are the dim ones, and you’ll need a telescope (or some very good binoculars) to see them. You’ll also need to know how to read star charts to find them. 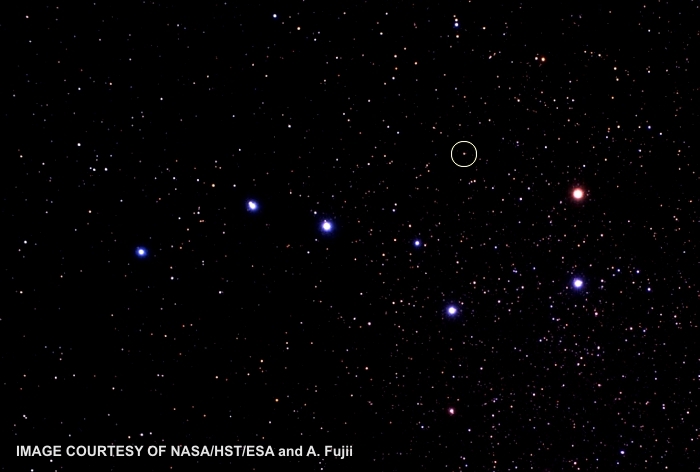 Check out the star circled in yellow above the Big Dipper. That’s the kind of star you’ll buy, and it’s not visible to the unaided eye. These dimmer stars all have numeric designations, but no official names. Only the International Astronomical Union (IAU) can approve official names for celestial objects. Those names are often chosen from mythology. Exceptions are asteroids, which can be given a name chosen by their discoverer (subject to IAU approval), and comets, which automatically receive the name(s) of their discoverer(s). For example: Comet Shoemaker–Levy, which collided with Jupiter in 1994. I first addressed this topic back in 2005, but it seems to always come up around the holidays. People are looking for that unique gift idea, and these companies provide that service. You get a fancy certificate with instructions how to find your star, and a star chart to help you locate it. But unless you can read astronomy charts, and know what it means when they say your star is located at RA 05h 55m 10.3053s and DEC +07° 24′ 25.426″, good luck finding it. Previous Previous post: Q&A: Santa’s Sleigh Spotted?